Prototype: German Federal Railroad DB class 95.0 former Prussian T20 freight tank locomotive. Version with 3 domes, welded water tanks without rivets and with openings, and German State Railroad lanterns. Road number 95 006. The locomotive looks as it did around 1953. Model: The locomotive has an mfx+ digital decoder and extensive sound functions. It also has controlled high-efficiency propulsion with a flywheel, mounted in the boiler. 5 axles powered. Traction tires. The locomotive is constructed chiefly of metal. A 7226 smoke unit is included. The dual headlights change over with the direction of travel. They and the smoke unit contact will work in conventional operation and can be controlled digitally. In addition, the cab lighting can be controlled digitally. Maintenance-free, warm white LEDs are used for the lighting. There is a close coupler with an NEM pocket and a guide mechanism at both ends of the locomotive. The minimum radius for operation is 360 mm / 14-3/16". Piston rod protection sleeves, brake hoses, and a smoke unit are included. Length over the buffers 17.4 cm / 6-7/8". 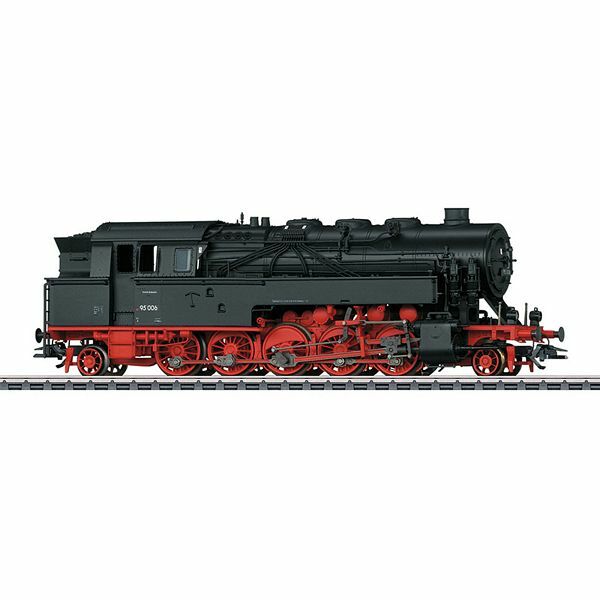 A freight car set to go with this locomotive is being offered under item number 48827 also exclusively for Insider members. A DC model of this locomotive can be found in the Trix H0 assortment under item number 22295 exclusively for Trix Club members.